Many, many years ago, I read a short story about a young man and woman who, on an English Summer’s day, are frozen in time by visitors from elsewhere, probably the future. There’s a good story that follows, which I won’t go into here, and I really enjoyed it. The only problem was that I read it when I was about 10 and I was at someone else’s house, flicking through their book collection. After that point, although I remembered the story, I did not remember either the title or the author. Now, this begin before the age of easy searching, I really had no simple way to find the story, unless someone else had read it and recognised my telling of it. When you tell your version of a story to someone else, it’s much like when you make a map – you put the things that interest you on there and this often reveals how much difference there is in interpretation. Some years went by, probably about 25 or so, and I had taken to browsing collections of short stories in second hand book stores, looking for the work. It wasn’t a full-time occupation but, if I ran across a new store, I’d duck in and see what they had. I must have looked over about 10 countries, on three continents, idly looking for a story that I (by now) dimly remembered. One day, I found it. 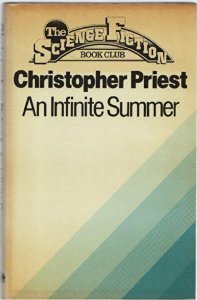 The name of the story was “An Infinite Summer” by Christopher Priest, who was actually someone I had read and enjoyed for his novels, in a collection of the same name. I was so delighted after so many years of searching that the bookseller asked me what was up and, on hearing the story, gave the book to me for free. This happens to be the version I have now. A simple cover belies a complex set of stories. And it’s still a great story. Character driven, well-written and with just enough time travel to make it work, without bogging down in the unnecessary mechanics of impossible machines. Let’s move forward to this year, some 10 years later, and I happen to be at LonCon3, the World Science Fiction Convention for 2014, in the room for the sessions “In Conversation: Naomi Alderman and Christopher Priest”. I’m rather excited as I’d never seen Priest in the flesh before and his story is a part of the unfolding of my life. It wasn’t exactly a Golden Fleece but it was definitely a plank on the ship! So the conversation unfolds and, delightfully, Priest is fiery, smart, opinionated, unrepentantly definite about things that I also happen to be unapologetic about and then he talks about his writing. “I don’t believe in aliens, space ships or time travel”, he says, which explains much of his work and its fascination with a very human future, devoid of most of the tricks that are used to bring tension into the narrative. But the time travel thing piqued my curiosity, because “An Infinite Summer” is a glorious tale of time and time lost, told within the mythical context of the endless English Summer. There’s a pause, some time for recollection, and he says” Well, yes, they stopped people in time.” A pause. And he pauses again, nods, and there is a bit of a chuckle from the audience as the moderator notes that I appear to know that work better than he does now. “Yes,” he says, “thank you.” I must be honest that his “thank you” sounded a little… cool but I suspect that this was because I was terribly embarrassed myself for putting him in that position. And yet, what a testament to the strength of the original work and its concept! There I am, transfixed and frozen in time at a moment where a much younger Christopher Priest is writing this story – this story reaches out to me and holds itself in my memory and it is a part of the mythology of my own life. Yet, he, having set the tableau down, moves on to do other things. This is “An Infinite Summer”, told with new players, and possibly, having written this down, somewhere it will be told again. You never know how people are going to remember you and, in the short span that I’ve been blogging, it’s come back to me how some of my posts resonate deeply with people (not many) and they remember the contents more than I do. Yet I’m already moving on and looking ahead to other things. I should have known this because, as an educator, I sometimes have a bigger place in someone’s world than they do in mine – which I’m trying to change by getting to know my students better. I’m an okay person but I’m a lousy creature of myth. I don’t actually think I bothered Mr Priest with this and I still love that story – now it’s helped me to realise and appreciate how your works can be seen over a lifetime but also, before I actually get much older, to realise that what I have done is another set of steps towards what I’m going to do. Thank you, Christopher Priest, for a wonderful story, an experience that echoed it, and being extremely willing to participate with a community that obviously enjoys your work.